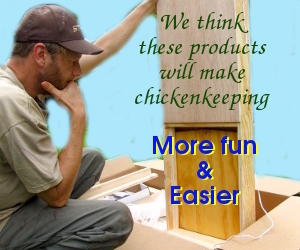 Building a coop offers chickens a sheltered place to hide out from the harsh elements like rain, snow, heat and cold. A well built coop will also protect them from predators and ensure them healthy, comfortable life. In addition they will produce quality eggs in return. Dogs, cats, raccoons, opossums, skunks, mink, fox, coyotes, hawks, owls, neighborhood children etc. You name it they will kill your chickens! A safe coop is a necessity for anyone raising chickens, and fortunately there are many different chicken coop designs available. Materials such as PVC pipes, tarps, converted old campers, have all actually been used material for chicken coops, however well constructed wood sheeted coop is the safest and most common way for building chicken coops. However before purchasing a chicken coop kit, keep in mind the size of the coop run and number of chickens the coop will host. Each chicken needs at least 2 sq feet of space and larger breeds of poultry may need at least 4 to 5 sq feet of space. New lumber can be expensive to purchase, depending on the size of the coop: some second hand stores actually sell used lumber that works just as good! A safe coop should be entirely enclosed leaving no opportunities for crafty critters to find a way in. If you desire to have a fenced in area for your chicken the most cost effective way to do this is to construct a chain link fence around the designated area for your chickens (chicken wire or netting may be equally as economical). 2 inches in order to get through. 3. Also to protect from things climbing over and birds of prey, wrap the chicken wire fencing over the top so nothing can climb/fly over. 4. Finally, dig a one foot trench around the base of the chain link fence and tie you chicken wire to it allowing it to drop down into the trench. Now simply reapply the dirt and burry the fencing. Finally an Automatic Chicken Coop Door can greatly improve your chance of avoiding a predator getting into your chicken coop. The majority of chicken attacks happen in the evening as most predators to chicken are nocturnal hunters. If you are new to chicken keeping you soon will realize the struggle of rushing home from work or from dinner with friends to be sure the chicken coop door gets closed before a local predator pops in for a snack. You number one defense against these attacks and fatalities are to automated the opening and closing of your chicken coop door. As an added bonus to a door closing automatically when your not home it will also open back up the following morning to let the chickens back outside. This gives both you and the chickens the freedom you want. This makes chicken keeping less of an obligation while also keeping the “girls” safe. Taking these proper precautions will help your chickens to have a safe place to enjoy the outside but still remaining safely out of reach of predators so you can rest easily. waterers. But all good things must come to an end. A move to Ohio required us to make hard choices about which items to include in the moving van, and new interests are pulling us in different directions as well. If you’re interest in learning more about chickens, on the other hand — stick around! We’ll be revamping the blog with new articles in the near future. Stay tuned! We’re moving to a new homestead in a new state, and all of our chicken waterer supplies have been packed away for the transition. So our store is on summer vacation and we are unable to ship any waterers at this time. I apologize for the delay! Or come hang out with us online. Our homesteading blog is full of diy tips, pretty pictures, and highlights of our day. We look forward to seeing you over there!